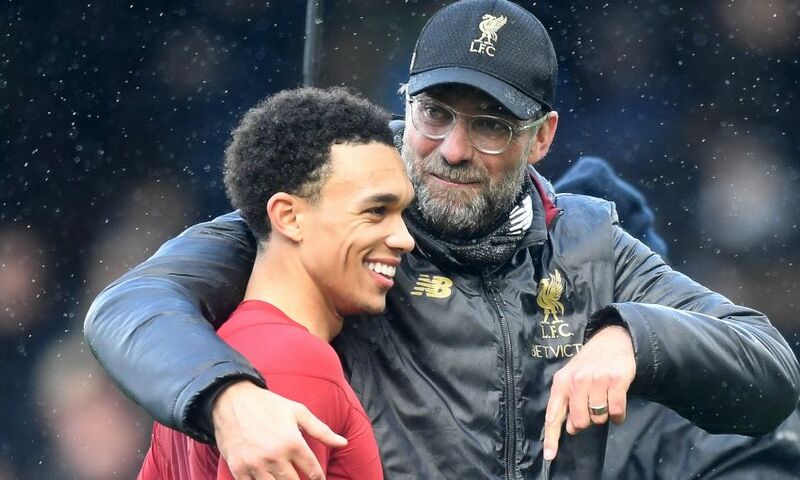 Controlled passion is a trait Trent Alexander-Arnold believes he shares with Liverpool manager Jürgen Klopp. “His personality is similar to mine,” the right-back tells The Times. “When I look at him he’s a little reserved around the training ground. But he has still got that presence in rooms. “Then as soon as you step outside he’s animated, he’s loud, he’s very passionate about the things he believes and the way he wants to play. His players have got to embody that. “[His message is] to be confident on the pitch. To go out there and feel I’m valued within the squad. Probably not to think of myself as that young player still coming through. Alexander-Arnold will hope to be in that Klopp XI when Liverpool welcome Chelsea to Anfield for a crucial Premier League contest on Sunday. Before a ball is kicked – with fellow title-chasers Manchester City facing Crystal Palace earlier in the afternoon – the Reds lead the table by two points having played a game more. The match represents a sharp parallel for Alexander-Arnold, in such typical football fashion. On the April day in 2014 when Chelsea damaged that Liverpool side’s championship hopes, the now England international with 50 Premier League games under his belt was a ball boy. “I was on the halfway line with a horrible view of what happened. But hopefully we’ll be able to make things right and it’ll be us that wins 2-0,” states the No.66. “If you asked fans now about 2013-14, they’d say the team gave everything, even if it wasn’t enough. Whatever happens, hopefully that’s the way they’ll see this. “Everybody watching the season will have respect for both [Liverpool and City]. Not being big-headed or anything but our team has shown it’s world-class and one of the best in recent years in the Premier League. “Going toe-to-toe with one of the best, if not the best, Premier League teams ever in City is astonishing. Whether it’s us or any other team, that deserves respect.